First-rate space opera "spaction"—a new epic adventure begins! Sales, Ian. A Prospect of War. Tickety Boo Press Ltd., 2015. Said book can be bought right here! Best of all, this space opera is way more interesting than real opera, because there’s just a whole lot more going on with a lot less (practically none, really!) full-throated warbling whilst striking dramatic poses on stage. Seriously, how many operas have you seen? Be honest: you secretly (or perhaps openly!) think opera is pretty dumb, right? But I’ll bet most of you totally like the idea of (outer) space, especially when there’s ships blowing up and people getting impaled on swords and everything! So how did we get the term ‘space opera’? Space is way cooler than opera. But I don’t want to be a complainer, so I’m here with an alternate suggestion: spaction! That’s exactly what A Prospect of War is: major action, involving spaceships and brief stops on planets and conspiracies against an ancient, seemingly stable empire. Plus, Sales took a hint from Frank Herbert’s brilliant innovation to combine spacefaring civilization with swords: the technological explanation is similar, something along the lines of projectile weapons being ineffective against personal shielding gizmos so all high-class people master the sword. The most interesting innovation Sales brings to the spaction is the seemingly harsh neo-feudal system in place throughout the enormous empire. Society is stratified into the noble class (hardly any), the yeoman class (an elite few), and proles (the 99%). The difference between the two elite classes is tiny compared to the rigidly enforced gulf between the proles and the higher-ups. That said, among the epic cast of characters, several yeomen-class figures end up impersonating proletarians, with varying degrees of effectiveness (coaching from a linguist helps one yeo(wo)man temporarily shed her haughty aristocratic speech patterns and accent). It’s fascinating to consider a multi-planet empire that has devolved in its social system to a complicated feudal monarchy, and not necessarily implausible either. However, it seems to me it would be all too easy for people in such a universe to fake it—both ways (assuming they have the means to acquire a suitable costume). Right from the beginning of the story, it’s so tremendously useful for elites to use the giant world of the underclass that despite their classist distaste for the idea, they keep doing it. Obviously the reverse is a lot more destabilizing to the social order, and there are a few offhand comments by characters suggesting (that they believed) any prole who dared attempt such a revolutionary act would be caught instantly (and it’s an offense punishable by death, which would provide a healthy deterrent for most, to be sure!). This is by way of saying that the sociopolitical system, while interesting on an intellectual level, sounds a couple of gentle pushes from total systemic collapse (and to be fair, this is the first part of a larger series which will certainly explore the weaknesses of the seemingly eternal empire). Aside from this quasi false note, however, the rest of the story and its characters are quite engaging (though Casimir’s journey to maturity was quite a jerky, abrupt roller coaster), and I’m looking forward to the subsequent installments! 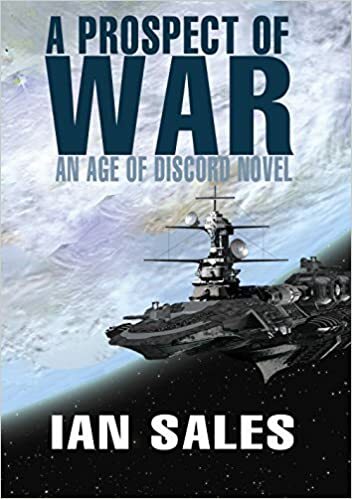 To Ian Sales, and in honor of Thanksgiving: I'm thankful for A Prospect of War (which sounds pretty weird unless we all understand it's a book title!). Nerd coefficient: 8/10 "something pretty awesome this way comes" (see stuff on scoring here). This message brought to you by Zhaoyun, spaction-lover and reviewer at Nerds of a Feather since 2013.